Background: Vertical vein is left patent in some cases of supra-cardiac total anomalous pulmonary venous connection (TAPVC) when there is hemodynamic instability due to noncompliant left atrium and ventricle. After the peri-operative period, this results in features of pre-tricuspid shunt. Materials and Methods: Three cases with patent vertical vein following repair of supra-cardiac TAPVC presented with features of pre-tricuspid shunt on follow-up. Trans-catheter closure of patent vertical vein was performed using vascular plug in all three subjects. Results: The procedure was technically successful in all the patients. There was a complication related to catheter tip breakage in one of them, which was successfully managed. There was no impingement on pulmonary vein in any of the patients. Conclusion: Patent vertical vein following TAPVC repair results in features of pre-tricuspid shunt. Transcatheter closure of the patent vein is feasible. Total anomalous pulmonary venous connection (TAPVC) is one of the common cyanotic congenital heart defects that manifests during infancy. The surgical correction includes rerouting of pulmonary veins to the left atrium, ligation of the vertical vein (VV), and closure of interatrial communication. Chronically under filled left atrium and left ventricle may cause hemodynamic instability while coming off cardiopulmonary bypass. In some cases of supracardiac TAPVC, keeping the VV patent may prevent acute pulmonary edema and pulmonary venous hypertension in the immediate postoperative period. We report three cases of transcatheter closure of persistent VV after TAPVC repair. The baseline characteristics of the cases are given in [Table 1]. All three patients underwent complete clinical examination including transthoracic echocardiography [Figure 1]. A detailed diagnostic cardiac catheterization study was done in all three cases including quantification of the shunt by Fick's method, estimation of pulmonary vascular resistance, recording of pull-back pressures from left atrial (LA) to VV, and trial occlusion. The patent VV was occluded using a 24 mm Amplatzer sizing balloon in both cases of repaired supracardiac TAPVC and with Tyshak II balloon (10 mm Χ 20 mm) in the case with mixed TAPVC. A separate femoral venous access was taken to measure the pulmonary artery (PA) wedge pressure using Swan-Ganz catheter More Details. The cardiac output, systemic and PA wedge pressures were measured 10 min after trial occlusion. The hemodynamics remained stable during trial occlusion. Selective VV injections and levophase of PA showed dilated patent VV and good communication between LA and VV. All three cases were found to be suitable for transcatheter closure of patent VV after the diagnostic study. Elective transcatheter closure of the patent VV was planned after obtaining informed consent. A left jugular vein, femoral vein, and femoral artery access were obtained in all cases. Levophase of PA angiogram and selective VV injections were done for reference. A 9 Fr short sheath was introduced into the patent VV using guide wire [Figure 2]a. A 22 mm Cera vascular plug (LifeTech sciences, Shenzhen, China) was selected. This ensured a device diameter 1.6-1.8 times larger than the stretched balloon diameter of the VV. The position was confirmed by angiogram [Figure 2]b-d. Right femoral venous access was used for the procedure. Initially, the VV was entered using a multipurpose catheter. However, the catheter tip broke and embolized into the right PA during the exchange. Subsequently, an 8 Fr Mullins sheath (Cook Medical Corp.) was positioned in the VV and a 20 mm Amplatzer vascular plug II (St. Jude Medical Inc., MN, USA) was deployed. However, the procedure was abandoned due to obstruction of the left upper pulmonary vein by the distal disc of the device [Figure 3]a and b. The embolized tip of the multipurpose catheter was removed using a 3 mm coronary snare. The procedure was re-attempted 2 days later from the left jugular venous access using a 9 Fr short sheath. 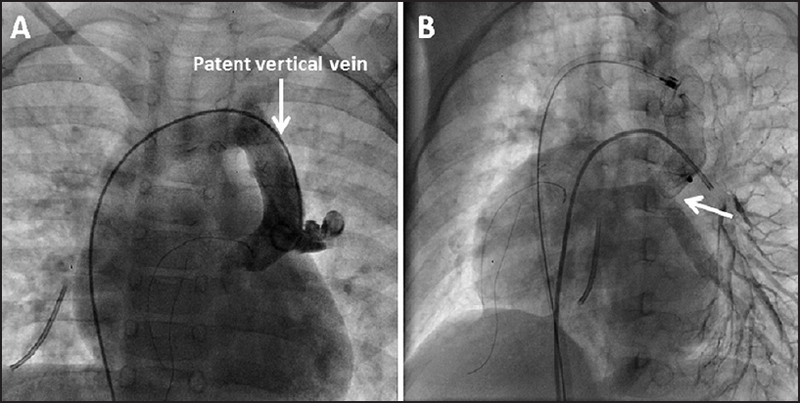 A 22 mm Cera vascular plug (Lifetech scientific, Shenzhen, China) was deployed in the VV and its position confirmed in levophase of left PA angiogram [Figure 4]. The pulmonary venous flow was unobstructed and drained to the LA. An 8 Fr short sheath was placed in the left jugular vein to close the re-canalized VV in a child with surgically corrected mixed TAPVC. A 16 mm Cera vascular plug was used for closure and confirmed on levogram of left PA injection [Figure 5]. All patients were discharged 24 h after the procedure and advised to continue oral aspirin for 6 months. The procedure was successful in all cases. The baseline Qp/Qs and mean PA pressures were <2:1 and <20 mm Hg, respectively, in all cases. Immediate shunt occlusion was achieved in all three cases. There was no major procedure related complications. Minor procedural difficulties were encountered during closure in Case 2. The Amplatzer vascular plug II could not be positioned as the distal disc was projecting into left pulmonary vein despite multiple attempts. It was thought to be due to the trilobed nature of the device and subsequently changed to Cera vascular plug. The multipurpose catheter tip broke during the exchange to a stiff guide wire and was successfully retrieved using a 3 mm coronary snare. Follow-up evaluation by transthoracic echocardiography showed no residual shunt, normal cardiac chambers, and normal pulmonary venous flow to the left atrium in all patients. Computed tomography angiogram during follow-up of Case 2 showed well-positioned device with no pulmonary venous obstruction [Figure 4]. A patent VV presents as a pretricuspid shunt and produces right heart dilatation. Even in the absence of anastomotic obstruction from common venous chamber to left atrium, blood tends to flow preferentially from the common venous chamber toward the right atrium instead of the left atrium due to relative differences in the compliances of the right and left ventricles. Patent VV requires closure in the presence of right heart dilation, PA hypertension, or congestive cardiac failure. Narula et al. reported successful closure of a large VV using Amplatzer duct occluder and Amplatzer vascular plug II. , It is necessary to document stable hemodynamics by test balloon occlusion of a patent VV prior to its closure. In all our cases, we preferred "Cera" vascular plug fabricated with expanded polytetrafluoroethylene as it molds itself to conform to the shape of the vein. It is difficult to position the tri-lobed Amplatzer vascular plug II within a VV where minimal encroachment by the disc would result in pulmonary venous obstruction. Choice of the device depends upon the size and shape of the vein. In all cases, the left jugular venous approach was preferred as it was in anatomical alignment with the VV. This minimized catheter manipulation and allowed easier device deployment. Late presentation of patent VV mimics pretricuspid shunt due to passive shunt from the pulmonary vein to systemic vein. Exercise intolerance, fatigability, and the presence of right heart volume overload may warrant closure. The endovascular closure is preferred due to the location and anatomical nature of this venous structure. Transcatheter closure through left internal jugular approach appears to be simple due to the alignment of the delivery sheath during vascular plug deployment. Van Praagh S, Geva T. Anomalies of pulmonary veins. In: Allen HD, Driscoll DJ, Shaddy RE, Feltes T, editors. Moss and Adams. 7 th ed. Philadelphia: Lippincott Williams and Wilkins; 2008. p. 761-91. Cheung YF, Lun KS, Chau AK, Chiu CS. Fate of the vertical vein after repair of supracardiac TAPVC. J Paediatr Child Health 2005;41:361-4. Cope JT, Banks D, McDaniel NL, Shockey KS, Nolan SP, Kron IL. 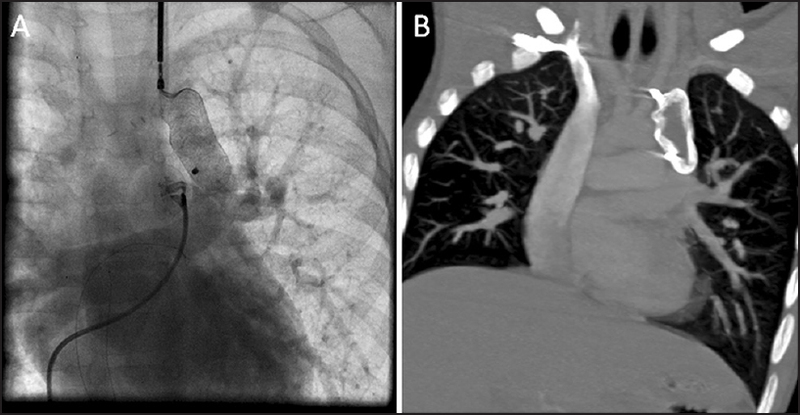 Is vertical vein ligation necessary in repair of total anomalous pulmonary venous connection? Ann Thorac Surg 1997;64:23-8. Parr GV, Kirklin JW, Pacifico AD, Blackstone EH, Lauridsen P. Cardiac performance in infants after repair of total anomalous pulmonary venous connection. Ann Thorac Surg 1974;17:561-73. Caspi J, Pettitt TW, Fontenot EE, Stopa AR, Heck HA, Munfakh NA, et al. The beneficial hemodynamic effects of selective patent vertical vein following repair of obstructed total anomalous pulmonary venous drainage in infants. Eur J Cardiothorac Surg 2001;20:830-4. Narula N, Wilson N, Kumar RS. Transcatheter closure of persistent unligated vertical vein after TAPVC surgery using the Amplatzer PDA device. Catheter Cardiovasc Interv 2007;70:117-9. 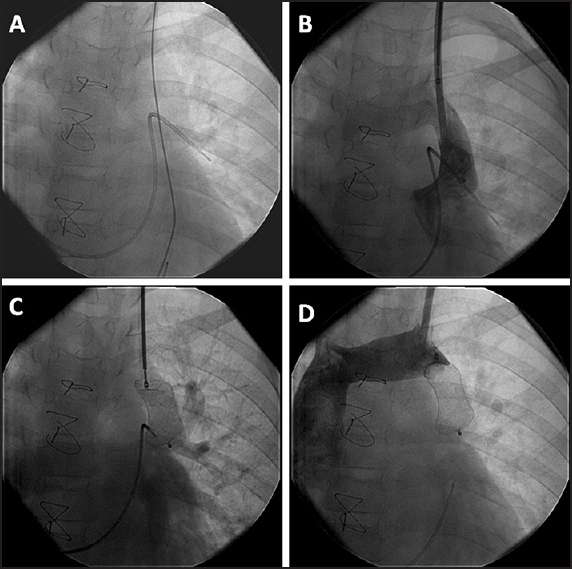 Devendran V, Wilson N, Jesudian V. Percutaneous closure of a large unligated vertical vein using the Amplatzer Vascular Plug II after supracardiac total anomalous pulmonary venous connection (TAPVC) repair. Pediatr Cardiol 2013;34:1976-8.